Party Time Bounce LLC Inflatable Moonwalks! 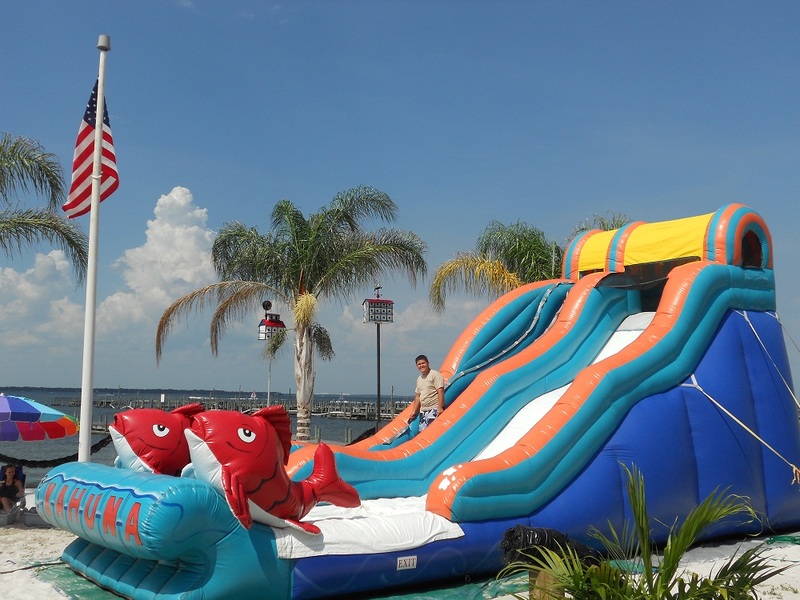 Okaloosa Walton County Best Inflatable Party Rentals! Welcome to Party Time Bounce LLC!! Our goal is to be your first choice in moonwalk rentals in the North Okaloosa/Walton County Florida area. 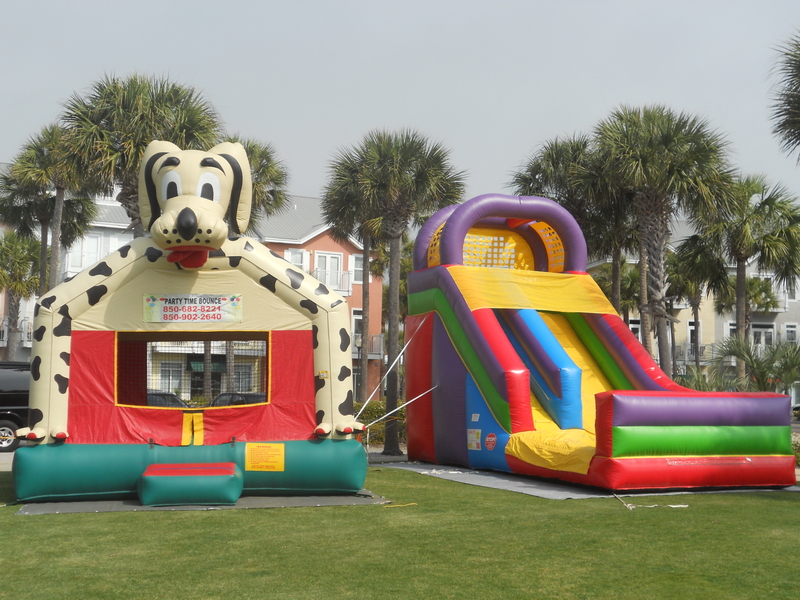 We are your Premier Provider for Party Rentals in the Florida Panhandle! It is Party Time Bounce's privilege to serve those who serve us. To salute our nation's heroes we offer a 10% discount to Active Duty/Retired/Reserve - Army, Air Force, Navy, Marine, Police, Firemen. Specials are Not valid with any other discounts or coupons. These offers are for home or residential parties only. ! Click below for what's new and to check out our monthly specials. We have Sponge Bob, Dora and Disney Princess. Click 'em to see 'em. Want fun? We deliver!! We have the largest delivery area of all the moonwalk rental services operating within Florida's Okaloosa County. We guarantee on-time delivery from Navarre to Defuniak Springs, Crestview to Destin! Click anywhere along this line to view a partial list of our many satisfied customers. We guarantee to have the cheapest delivery price in Crestview. Us = $25.00, them = $$$. Save even more to Destin! Us = $60.00, them = $$$. We still beat their DIY prices and we do all the work!! Please, click below for a price list. Hey parents!!! Here are some great safe sites for the kids!! Just click anywhere on this line! 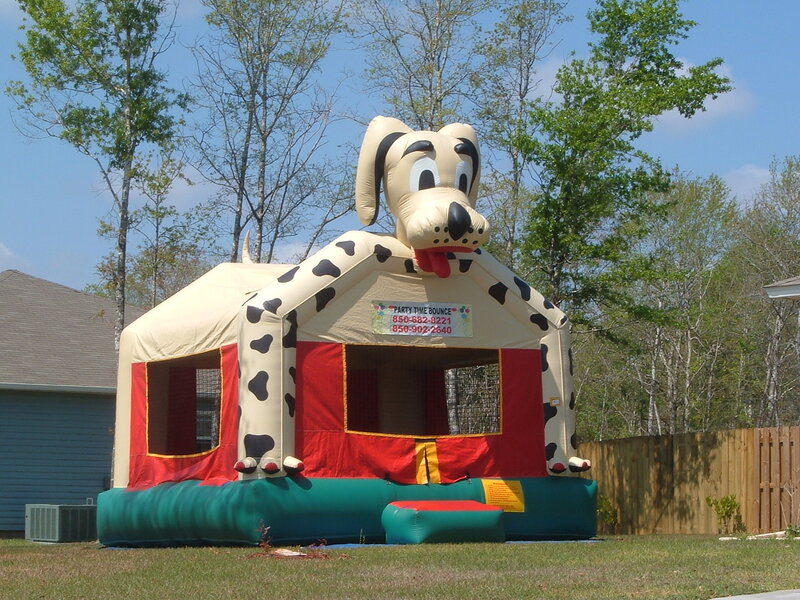 With Party Time Bounce LLC, you can have your party and peace of mind too. Our insurance covers every event. That's because WE deliver and setup 100% of the time. If you pick up and set up yourself, then you take the risk. We gladly take the risk for you. Not all items on this site may be available in our inventory at all times. We belong to a network of companies and occassionally "share" equipment with others. Please bookmark us (add to favorites) and email this site to your friends! Please, press Ctrl-D to bookmark this page. Please, sign our guestbook. We do appreciate your comments/suggestions. Click on Crestview below to help with your party plans. Up to 10-day weather forecasts available. Inflatable Moon Walks? It's all in a name! 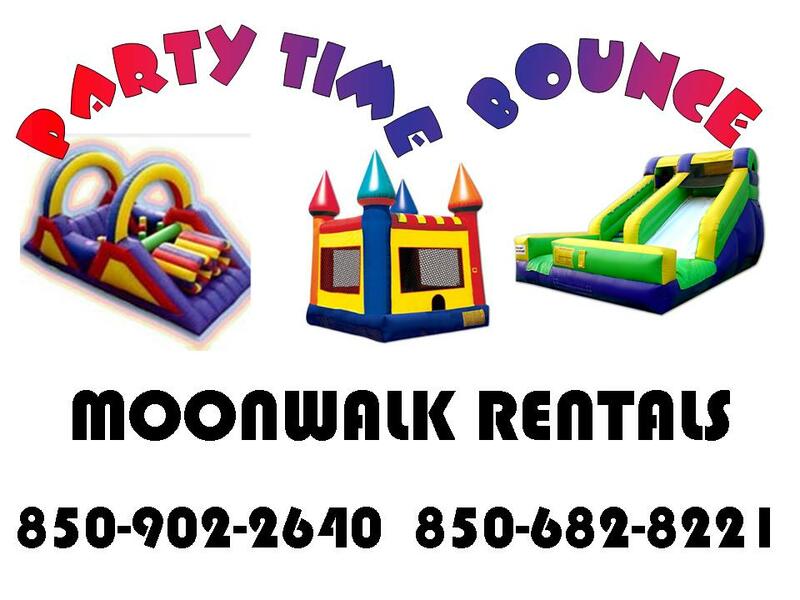 Moonwalks are sometimes referred to as; Inflatables, Bouncers, Bounces, space walks, Jumpers, Jump House, Bouncy, Bouncy Castles, Bouncy Thingy, Funhouses, Bounce houses and also Moon Bounce. So what ever you like to call your moonwalk, we're sure of one thing, we have the inflatable you need to make your next occasion one to remember! 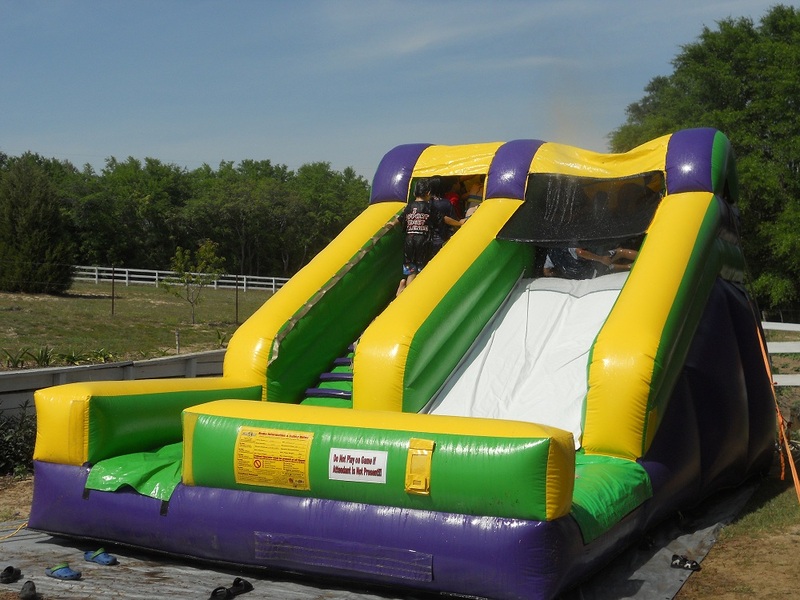 We'll be there with your inflatable slip and slide, inflatable obstacle course or inflatable slides, clean and on-time!! Every time!! 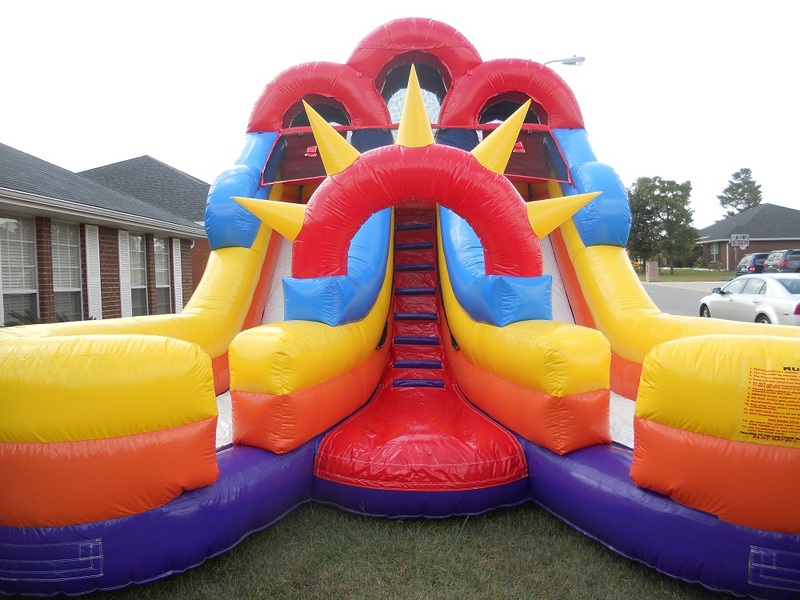 Call Party Time Bounce LLC for your next inflatable rental! We deliver fun throughout Okaloosa County, Florida. We also provide service to portions of Walton and Santa Rosa County in Florida. Call us for your needs in Fort Walton Beach, Destin, Navarre, Bluewater Bay, Santa Rosa Beach, Sandestin, Mary Esther, Hurlburt Field, Eglin AFB, Crestview, Baker, Milton, Holt, Valparaiso, Niceville, Defuniak Springs, Florala, Mossy Head, Freeport and all places in between. Need something we don't carry? We belong to a nationwide network of insured inflatable owners and will work to get you what you need.